Explore the city with ease using this one-day travel pass and tour combo that hits all of the Hong Kong highlights. Enjoy a day of unlimited Mass Transit Railway (MTR) use and a round-trip ride on the Ngong Ping Cable Car over Lantau Island. See the sights on a Big Buddha walking tour once you arrive on the island and pay a visit to Tai O fishin village and the famous Big Buddha. Choose from upgrades like a 3-day MTR pass that includes Airport Express tickets or a glass-bottomed crystal cabin Ngong Ping Cable Car. Collect your passes upon arrival when you book in advance. This travel pass combo insures you can make the most of your time in Hong Kong. Collect your tickets and MTR pass at the Sha Tsui Ferry Pier and head out on an adventure that puts Hong Kong at your fingertips. Enjoy unlimited use of the MTR (Mass Transit Railway), including bus, light rails and trains using this Hong Kong Travel Pass Combo. Plenty of options means it’s easy to see all of the island’s top attractions. Use the easy to navigate MTR to travel between Hong Kong’s districts and the island’s 10 rail lines lead to places like Sheung Wan and Disneyland. The light rail is ideal for travelers trying to make their way to the New Territories. Use this helpful pass to get from Hong Kong airport to the city upon arrival and save the return trip for your departure. There are four possible departure times for your Ngong Ping Village walking tour: 11:30am, 12:30pm, 2:15pm and 3:15pm. Arrive at the Ngong Ping Cable Car and hop aboard to make your own way to the assembly point in Ngong Ping Village, where you’ll meet your guide. During the cable car ride, peer down from your standard cabin, enjoying the fabulous views as you travel across Lantau Island! The 25-minute ride begins in Tung Chung, crosses Tung Chung Bay and gives you unforgettable vistas of the hills, the South China Sea, the Ngong Ping plateau and the Tian Tan Buddha. Once you’ve met your guide, set off on your Big Buddha walking tour, heading first to Tai O fishing village to check out an example of a traditional fishing village home to the Tanka people. Hop aboard a boat for a brief ride around the village, where you can marvel at the homes built on stilts above the water and hear about the Tanka history as ‘fisherfolk’ (keep your eyes open for pink dolphins, too!). Next, follow your guide to Ngong Pong Piazza, a plaza made up of four features – New Pai Lau, Bodhi Path, Di Tan and a Chinese landscaped garden – which enhance the traditional Buddhist design of Ngong Ping. As you walk, check out the statues of the ‘Twelve Divine Generals,’ who are said to be protectors of Buddhism. Continue to Po Lin Monastery, the largest Buddhist temple in Hong Kong, and then finally reach the Big Buddha himself, siting serenely on the Ngong Ping plateau! After climbing the 200+ steps to get up to the statue, take a walk around the site. Admire the detail of the Buddha’s eyes, lips and raised right hand, and hear about its construction in the early 1990s (made of approximately 200 pieces of bronze!). 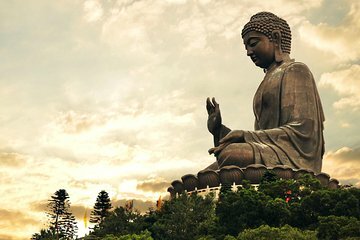 As one of the tallest outdoor seated Buddha statues in the world, it’s one of Hong Kong’s most iconic sights and offers great photo opportunities. Finally, end your walking tour in Ngong Ping Village, where you can browse the shops and restaurants and catch the cable car for your return ride. With this option, enjoy a round-trip ride on the Ngong Ping Cable Car from the comfort of a Crystal Cabin. With its glass bottom, the Ngong Ping Crystal Cabin provides you with unparalleled bird’s-eye views of Lantau Island and the surrounding scenery. Upgrade to this ultimate Hong Kong travel pass combo to also include three days of unlimited travel on the MTR plus a round-trip ticket for the Airport Express. It's the perfect and most convenient way to travel and sightsee around Hong Kong! This proved to be an excellent value. The 3 day MTR Pass worked perfectly to get us to and from the airport to our hotel and allow us to travel around. We had to add an extra day but it was well worth it. It was surprisingly easy to find the travel desk at the Hong Kong airport when we arrived and pick up the pass. The only glitch was that for some reason the Big Buddha tour had been scheduled for the afternoon we arrived whcih was within 1/2 hour of our plane landing and we didn't know that until we arrived at the Cable Car desk on the date we thought was booked only to be turned away. That meant we had an unnecessary trip out to the site and had to come back the next day. The Npong Ping Cable Car and Big Buddha Tour was very good. The guide we had was pretty good and provided an on-going commentary. The walk around the Tai O fishing village was interesting but the snack coupon that was provided actually wasn't a snack, we had to pay extra for it along with the coupon. As well the boat ride to see the pink dolphins was really rather brief. The cable car ride though to the top was stunning and the vistas of not only Lantau island but of over toward Kowloon/Hong Kong were amazing. We were lucky to have a relatively sunny day. Would very much recommend this tour. We had a wonderful day on this tour, and we highly recommend it. We were in Hong Kong on a cruise ship and this tour was much, much better value than anything the cruise line could offer. A star feature when booking the crystal cabin was the fact that we bypassed the huge queues for the gondola thus saving us well over an hour of dead time. The only pain is finding the location for the collection of the tickets. It was awkward and somewhat confusing, though we clearly sorted it out. The gondola ride with is fantastic, the Buddha well worth seeing: the walk up isn't that hard and the little fishing village is wonderful and definitely not to be missed. An outstanding day and great value. Traversing the MTR in Hong Kong is easy and the MTR Pass was a good option. I arrived at the Ngong Ping Cable car in what I thought was plenty of time to reach the Big Buddha for the tour. I had purchased the Crystal Cabin tickets which were supposed to provide priority for the cable car ride. Unfortunately, this was far from the case. I joined the line for the Crystal Cabin pre-paid tickets, which was very short happy!. The normal queue was for people who had not made a booking and had just turned up. However, this queue was speeding along 10 times faster than the Crystal Cabin, pre-paid queue. There were 10 people in front of me and it took more than 30 minutes to get to the ticket booth! Then you join the Crystal Cabin queue for the cable car. This too went slower than the normal queue!! There was no real organization and the Crystal Cabin cable cars were only one in every 3 or 4 cars. By the time I reached to top, I was 15 mins late for the tour which had departed without me. I walked around by myself and was impressed by the views and sights. 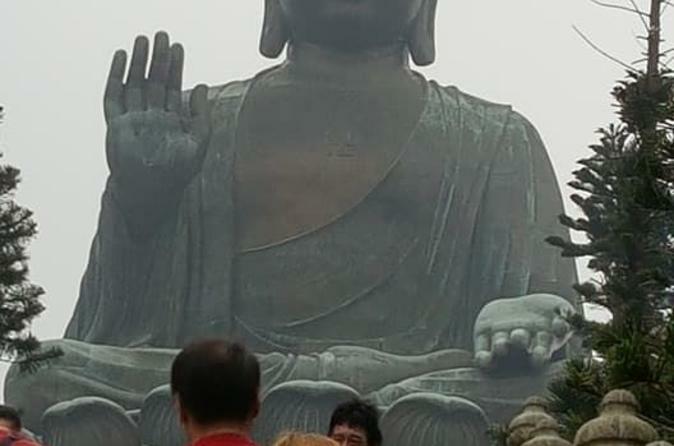 The Big Buddha was spectacular. I had a nice day. I would recommend that anyone taking this tour should only purchase the normal ticket. The Crystal Cabin has a glass bottom and that is the only difference to a normal Cabin. It also takes longer and has no real priority as described. An amazing tour and an amazing way to spend some time in Hong Kong. Ngong Ping Cable Car is very good. It is a shame They are not very good when you pick your tickets up at the base station. We never received are MTR passes as we were told we had to pick them up at the airport. !!!!. We were not given our passes for the Big buddha tour and had to sort this out at the top of the cable car which wasted a hour. This was very annoying when you only have a short time in a lovely place. The last thing you want to do is chase around to find your tour guide. It would have been helpful if the information we were given when booking was correct. A great tour! After collecting our tickets at Admiralty MTR station, we actually forgot to exchange our MTR pass and ended up continuing to use our Octopus card to get to Tung Chung. But we then used the the MTR pass the next day and it still ran for 24 hours. Once we got to Tung Chung it was relatively easy and quick to get our cable car tickets and onto the 360 cable car. Unfortunately the weather wasn't the best on our day fog and mist so we didn't have the clearest views, but it was still a good experience. We had a small hiccup when we arrived at Ngong Ping as we hadn't been given our walking tour tickets in our pack, but it was quickly sorted out when we visited the Information Centre and we promptly joined a tour. We had Annie as our guide and she was fab! So informative and fun! The fishing village tour was great - we were given tokens to exchange for a couple of local snacks which was an added bonus! It was nice to finish up viewing the monastery and climbing the steps to the Big Buddha. Tour itself good but a nightmare if you are staying in Kowloon and have to go to island to pickup tickets and train passes. Should be able to down the lot online and avoid an expensive taxi ride to go to HK island to pick up.  Have used Viator in the past in different countries and been very happy but this left us frustrated.